The Lincoln School staff, family, and community will form a partnership to provide a safe, caring, and secure environment where children are given meaningful learning opportunities to develop to their fullest potentials academically, socially, emotionally, and physically. Our school is unified in working toward this vision. We are committed to ensuring that all students will have equal access to the core curriculum. Our instructional program is based on the State Frameworks of Study and the State Standards and is implemented to students with a developmentally appropriate, integrated, child-centered, meaningful, hands-on teaching style. Students will develop content knowledge/understanding and skills in the areas of language arts, mathematics, science, social science, visual and performing arts, and health. Instructors will teach these subjects through an integrated curriculum. Students will become proficient in critical thinking and problem-solving. Students will develop positive self-awareness/esteem and respect for the dignity of others as classrooms will take on a community/family atmosphere. Along with the Character Counts program, we implement a cooperative learning style throughout the school. Lincoln Elementary is a Character Counts school. 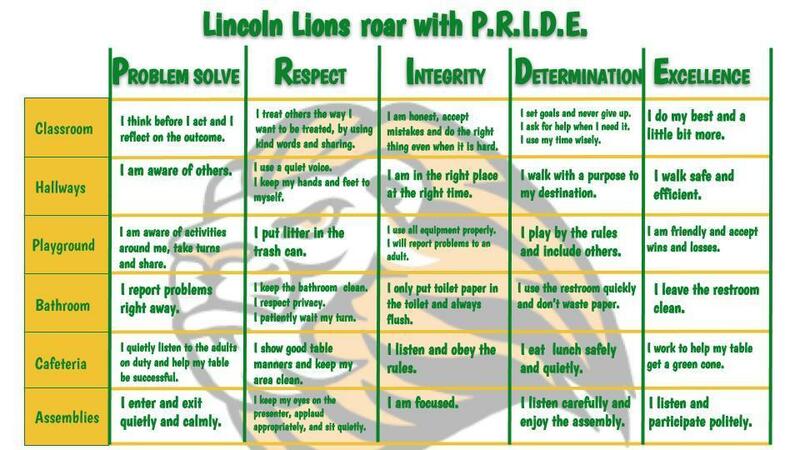 To help our students grow socially and emotionally in a safe learning environment we focus on the pillars of character and help them with behavior expectations by showing them how to Roar with P.R.I.D.E at school.